Mary Dell Fortune was born in 1926 in Baltimore, MD - the second child of Robert and Mattie Fortune named for two of her aunts: Mary Bell Fortune, who died as an infant and Dell Fortune. In her youth, most people called her Dell. At the tender young age of 5 she lost her father to tuberculosis and nearly died from it herself. Thereafter she looked up to her brother Bob as a father figure. She trained as a nurse and worked for a time at the Church Home & Hospital in Baltimore until her children were born. 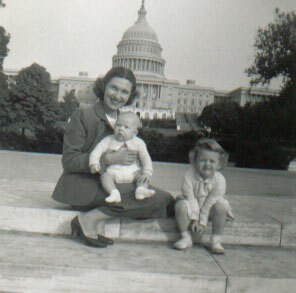 Mary Dell in Washington, DC with Jim and Dell. 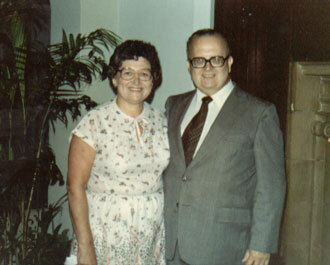 Mary Dell with her husband Neal. In 1952 on February 16 Mary Dell wed Neal Wogsland. Together they raised 3 children in Bel Air, MD. After her daughter Dell was born, she started going by Mary Dell to avoid confusion, however, her brother Bob continued to call her Dell for the rest of his life. After Neal's heart attack in 1989, they moved to Alpharetta, GA to be closer to their son, Jim, and his family and her brother, Bob, and his family. When Neal finally succumbed in 1991, Mary Dell was glad to have her supportive family nearby. 1n 1994 she lost her brother as well. 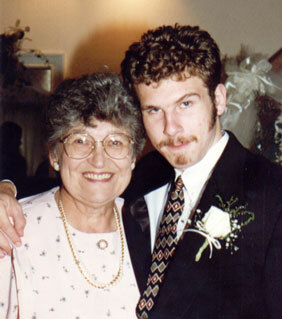 Mary Dell with her grandson Bradley at his wedding in 1997. 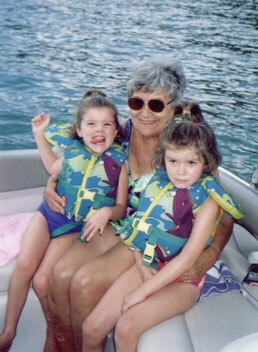 Mary Dell with her great-granddaughters in 2003. In the late nineties her daughter, Nancy, who was still single, moved in with Mary Dell until Nancy met and wed Ken. Mary now divides her time between her extensive family (5 grandkids and 3 great-grandkids), and church activities. Dell Marie Wogsland 1954 - ? James Obert Wogsland 1956 - ? Nancy Carol Wogsland 1958 - ? Last modified on 27 Oct 2006 by Bradley James Wogsland.